Guess what? Redistricting is political. The (Tacoma) News Tribune’s Peter Callaghan wrote a nearly unimpeachable story (I wrote “nearly” because we journalists are told to shy away from absolutes.) that shows how political the 2012 redistricting process was. Referring to emails the paper obtained through public document requests the story illustrates how involved incumbents were in protecting their turf and how both parties worked to maintain whatever advantages they had or to improve on disadvantages they thought they didn’t. The local angle comes in two cases. Republicans wanted new Sixth Congressional District boundaries in preparation for the day U.S. Rep. Norm Dicks would retire. The Democrat announced his retirement after the maps were drawn. Callaghan’s point was that a request like Seaquist’s was only honored if it answered the political demands redistricting commissioners were addressing, too. The state law regarding redistricting stipulates that the “commission’s plan shall not be drawn purposely to favor or discriminate against any political party or group.” How the commission goes about that is having two from each party on the commission. Three have to eventually agree on a plan, which means two from one party and one from the other have to shake hands on a deal. So the process is not non-political, it’s just set up so that the two parties have to work together to get a final deal done. Democrats Tim Ceis and Dean Foster issued their redistricting plans as a team. Republicans Slade Gorton and Tom Huff submitted separate proposals. Here are images of all three legislative proposals as far as they affect our three districts. 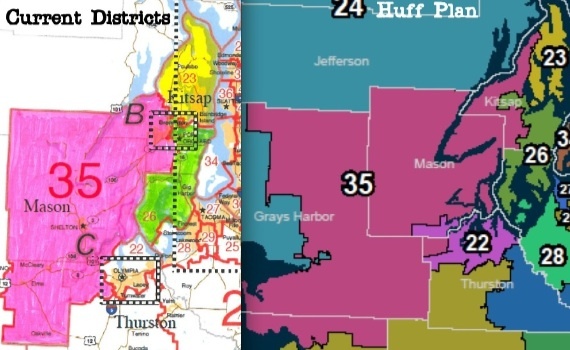 All four redistricting commissioners would take all of Kitsap County and make it completely fall within the Sixth Congressional District, moving the First District completely across Puget Sound. Even though this is the case now, in theory this could change. The commissioners vary drastically on where they put the new Congressional District. Any jockeying of that could, in theory, result in some lines moving. If Jay Inslee were not running for governor, it’s not likely this would have happened. At least Bainbridge would likely have remained in the First District. Again, politics are not supposed to be part of the equation, but a long time ago it was explained to me that the commission’s first unofficial task is to protect the incumbents. The state’s Redistricting Commission is supposed to release later today the different commissioners’ ideas for redistricting the state, but former U.S. Sen. Slade Gorton has his out there already. We’ll get to the impact here in a minute. To start, though, he puts the new 10th Congressional District along the state’s norther border from the San Juans to Okanagan. 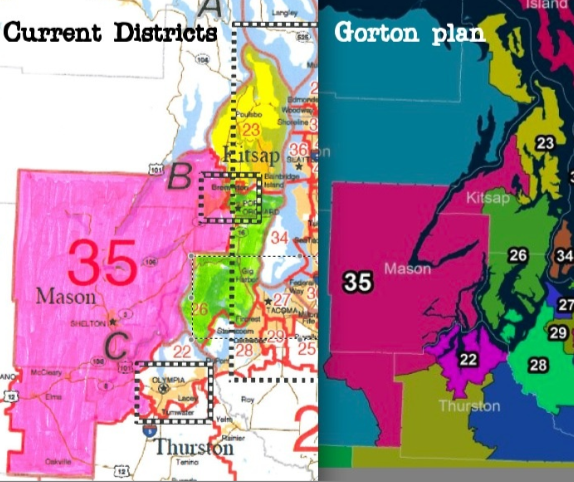 If Gorton’s proposal were to hold, all of Kitsap County would be in the Sixth Congressional District. AP has seen the other proposals but hasn’t gone into much detail about what would happen here. Legislatively Gorton’s changes would be significant. The 23rd District would lose Silverdale, but pick up downtown Bremerton and Port Townsend. I suspect Democrats will balk bigtime at that idea, because it creates a strong Democratic district that yes, pretty much guarantees James Olsen will never win a legislative election, but potentially makes the 35th and 26th Legislative Districts more conservative. That could present steeper challenges for Larry Seaquist in the 26th, but even more for Kathy Haigh in the 35th. Haigh’s win in 2010 was razor thin as it was. I know politics are not supposed to play into the conversation, but don’t expect Democrats to lay down for Gorton’s idea. When the others come out I’ll see if I can do what I’m doing here, which is laying out a comparative map like you see below. 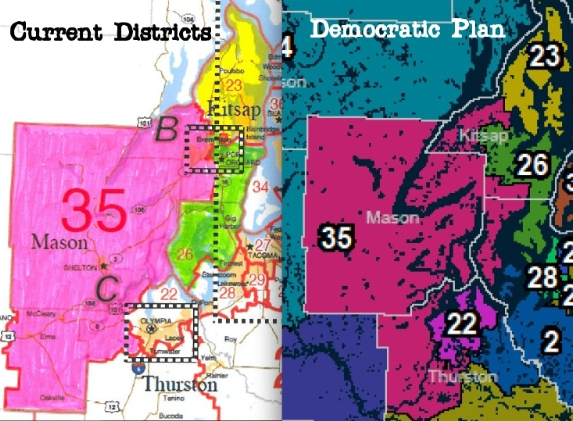 On Monday we had the story about Bremerton’s redistricting of its nine city council districts, pointing out that the city seemed headed toward a similar situation it had a dozen years ago. In one council election the loser in one district had more votes than the total number of voters in District Four. In 2002 the council accounted for that and made District Four much bigger than the other districts. As of today District Four has 6,341 resident. The next largest is District Two, with 4,362 residents. District Four now has nearly double the residents as District Eight. Still, with the huge presence of Navy personnel who vote in their home towns, District Four had the lowest turnout. As was pointed out Monday, the city interpreted existing law to state that it could no longer acknowledge that reality in its redistricting. District Four would have to return to near the same size as other districts. As it turned out the first proposal also left it as the lowest populated district overall, but only by 23. Bill Eley, the city’s information technology manager, figured out a way to remedy that. The district actually got smaller, but pulled residents from other more participatory districts and gave some of its Navy-heavy neighborhoods to District Seven, which also borders the base and the shipyard. Eley said District Four will still probably see the lowest turnout, but some of the Navy impact is shared. It is worth pointing out here that story commented Brandon_R made just this suggestion. I think he and Eley arrived at the same conclusion independently. I asked Eley how he came up with the new idea and his answer didn’t include reading our story. David Ammons in the Secretary of State’s office is reporting that Washington’s odds of picking up another congressional seat following the 2010 Census are still good. Official numbers won’t be out for another three months, but a company analyzing data from Census Bureau estimates has Washington picking up seat number 434 out of 435. The bigger story may be that it looks like the realignment would benefit Republicans more than Democrats. Assuming voting in congressional districts generally follow the overall movement of their states, if the GOP doesn’t take over the House in 2010, realignment could make it easier in 2012. States picking up one congressional representative are Washington, Arizona, Georgia, Nevada, South Carolina and` Utah. Florida would get two and Texas four. New York and Ohio would each lose two and Illinois, Iowa, Louisiana, Massachusetts, Michigan, Missouri, New Jersey and Pennsylvania would lose one. Of course, states do not vote in unison and redistricting/gerrymandering plays a role, as does the general mood of the country. Still, at least on the surface this looks like a Republican win.